Located in the Manyeleti Game Reserve, lie Honeyguide’s two tented camps, Khoka Moya and Mantobeni. Manyeleti, meaning “Place of the Stars” borders Kruger National Park, Sabi Sand and Timbavati and is a true Big Five Reserve. Honeyguide Mantobeni Camp is designed to reflect Hemingways’ Africa, this 12 tented camp is nestled in a Tamboti grove overlooking a dry river bed. The reception areas comprise a large sitting area, indoor and outdoor areas, bar and climate controlled wine cellar. Game visiting the nearby watering hole can be seen from the swimming pool deck adjoining the reception areas. 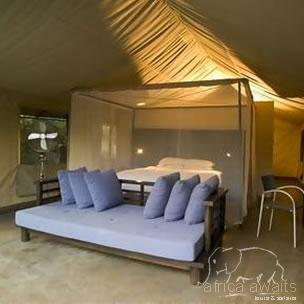 The tents are comfortably furnished with king-sized beds and soft leather couches. Each tent leads onto its own bathroom with concrete bath, double shower and separate toilet. Guests awake to the sound of beating drums and tea or coffee is served in the tents. Safaris in open game drive vehicles, led by experienced and qualified guides and trackers, are conducted in the early mornings and late afternoon / evenings. A foot safari is undertaken after breakfast, with emphasis on the abundant bird, insect and plant life surrounding the camps. 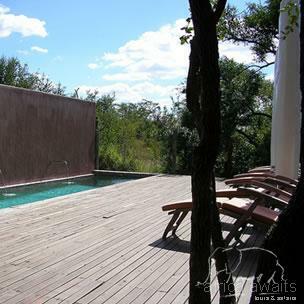 Guests may also choose to relax by the pool or browse through the small library at each camp. 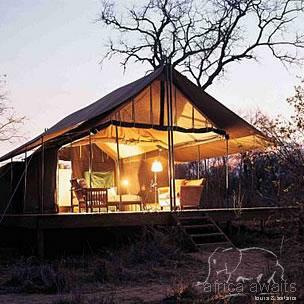 With your holiday, safari or business trip from in to Honeyguide Camp in Kruger National Park.